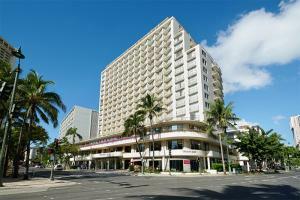 Located one block to Waikiki Beach, in the heart of Waikiki's action, this full service hotel is well suited for families with children. The hotel features well appointed, comfortable rooms designed for relaxation, an outdoor pool with whirlpool spa and a fitness center. Guests will enjoy a leisurely stroll or an open-trolley ride to Kapiolani Park, the Honolulu Zoo, and Waikiki Aquarium. Across the street from Kings Village, 1 block from the beach. Approximately 35 minutes from Honolulu Airport. Chuck's Cellar, Keoni By Keo's, Round Table Pizza & Sports Bar, KiMOBEAN Coffee Company, In-Room Dining.